Viernes de vocabulario: ¡échale ganas! Maybe you know that echar means to throw. But did you know all of the following ways you can use it? The verb echar is also used in dozens of more figurative ways of speaking. In English, you lend a hand. In Spanish, you toss one. If I’m having a hard time in school, I might ask a friend to echarme la mano. These are extremely common ways of saying that you’d like someone to be in touch with you. Instead of saying márcame or llámame, you can also say, échame una llamada. Someone who le echa mucha crema a sus tacos doesn’t just like a lot of cream on their tacos. They’re a showoff, a braggart, a conceited prig. Just like cream disguises soggy tacos, this person is trying to make him- or herself look better than she really is. ganas is a totally untranslatable Spanish word – and the likely star of a future viernes de vocabulario post – meaning something like desire, interest, or motivation in various phrases. To echar ganas means to put your heart into something. Are you having trouble in school? Échale ganas. Don’t want to clean your room? Échale ganas. As for your Spanish studies, ¡échale ganas, pues! While you’re here in Oaxaca, we encourage you to take advantage of all the city has to offer. You can find everything from traditional Oaxacan music to Spanish and English rock to jazz. Here are some of our favorite places to go and listen. Oaxaca’s central square has concerts on most evenings around 6pm. The state band performs on Sundays around noon. Café Central is one of the best-known bars in Oaxaca for live music. They also host free movies on Wednesday nights, but Thursdays, Fridays, and Saturdays, live music and dancing is where it’s at. Cover is usually around $50-$100 depending on the event. This tiny bar – which seats about 15 people comfortably – has live music every night, from trova on Sundays to an open mic on Tuesdays to rock on Friday and Saturday nights. There’s rarely a cover during the week, although Friday and Saturday you will probably pay about $30 to get in. The beautiful and historic Alcalá Theatre often hosts concerts of classical and folkloric music as well as dance. Much of the best live music can be found out and about in the city. Marimba and mariachi in the zócalo; guitarists roaming around the centro, and different musicians around Santo Domingo and Plaza Labastida. Keep an eye out for our favorite street musician. By now, you’ve probably noticed something is going on: there are people selling flags everywhere. Half the businesses and houses in towns have strung up all kinds of red, white, and green decorations. The Zocalo is full of red, white, and green lights. The phrase “pillow talk” – meaning, usually, the conversations you have with your partner late at night as you’re falling asleep – has no good Spanish translation. But in Spanish, the humble pillow has a place in a few expressions that sound much more prosaic in English. English speakers who are having a hard time making a big decision “sleep on it.” Spanish speakers consultar la almohada, or talk about it with their pillow. Someone who looks sleepy has a cara de almohada or pillow face. This phrase also refers to what happens when you’ve just woken up and have creases all over your face! Finally, you can also describe someone unattractive as having un cuerpo de almohada vieja “a body like an old pillow,” but it sounds at least as mean in Spanish as it does in English, so I wouldn’t recommend it. 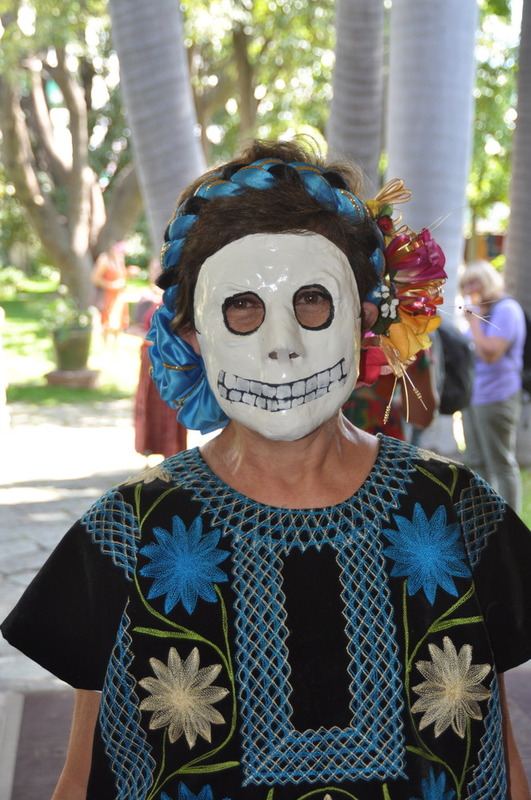 As Native Oaxacan, and as most Oaxacans would say you can come to Oaxaca at any time during the year, the weather it is magnificent, you can join Calendas, parties, and celebrations through the whole year, but my favorite time of year it is during the Day of the Dear, or Dia de los muertos. Many would say that Christmas is the holyday that is most celebrated in Oaxaca, but it is the Day of the Dead, I would say people invest more money on the day of the dead celebrations than in any other celebration, for that reason at ICO we have design a program that while studying spanish allows you to enjoy the magic and the beauty of Oaxaca. The Instituto Cultural Oaxaca’s Day of the Dead program consists of two weeks and this year we will have the following program. In the arternoons from Monday to Thursday we will have Cultural Workshops, but only for these two weeks of the year we host our Mask Making workshop. These masks are used during our Comparsa. On October 31 we will host our annual Comparsa in which all of students, teachers, friends and families join us at ICO to celebrate the return of the Dead. On this day we will have our althar ignauration. 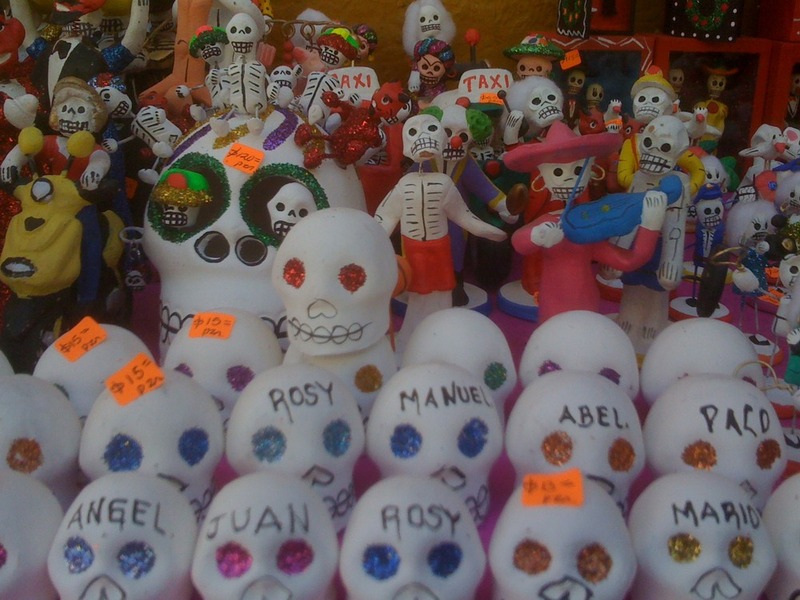 On October 31 we will visit the cemetery of Xoxocotlan. On November 1st we join the comparsas in the valley of Etla. On November 2nd we will visit the cemetery of San Felipe del Agua. In addition to activities held by the Instituto Cultural Oaxaca, while you are in Oaxaca you will be able to witness the Day of the Dead festivities from different angles. For example if you decide to stay with a homestay family there are many chances that you will participate in the family’s altar set up. It is very likely that the family will invite you to participate in the different family events in which all the family gets together to received the returning loved ones. In the streets of Oaxaca is possible to witness festivals, contests of altars, there flowers and sand tapestries everywere. I recommend that you visit the pateon general which open its doors to welcome of the families, friends and all visitors who would like to partake of this amazing experience. Markets – Previous to the Day of the Dead Markets operate at their full capacity everyone is buying flowers, candles, sweets, fruit, and all the ingredientes for their altars and of the preparation of the main meal, so the visit of a market is a Thing that you must do in Oaxaca during the Day of the Dead.